Anna Edwards of the Government Actuary’s Department considers insurance as a cost-effective solution to tackling poverty in developing countries and what can be achieved. The UK Government aims to end extreme poverty, helping countries in the developing world leave aid dependency behind to become our trading partners of the future. So, it is in the UK’s interest to build a safer, more prosperous world for all. Upholding manifesto commitments on UK aid by committing 0.7% of Gross National Income, in line with UN targets, is vital to securing Britain’s place in the world, exporting prosperity, security and stability. For all involved in allocating overseas aid, ensuring good value for money and demonstrating a clear development impact is always a top priority. In order to make every pound spent as effective as possible, the Department for International Development (DFID) is seeking innovative financial mechanisms to address key risks surrounding worldwide poverty. 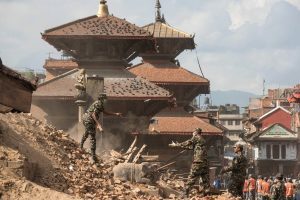 In recent years, considering the financing of disaster risk through insurance and risk-transfer mechanisms has become a key consideration in the global humanitarian sector. Such instruments are often cost-effective and facilitate economic development and recovery. DFID has been at the forefront of developing and financing these instruments in the global humanitarian sector. threaten lives and livelihoods and knock economies off their development trajectories. As climate change occurs, more people in developing countries are pushed below the poverty line as a result of more frequent extreme weather events, which can jeopardise sustainable development. There is limited or no insurance coverage, especially around public infrastructure and assets such as roads and schools. In order to protect development and pull people out of poverty sustainably, ways to finance disaster risk must be addressed through mechanisms that promote preparedness and resilience. DFID aims to give countries the tools they need to plan better for and manage the risk of disasters. Countries should be enabled to secure risk financing in advance of disasters, so that they can get themselves back on their feet. The Government Actuary's Department (GAD), a UK Government department that routinely advises other departments on financial and risk matters, recently undertook a DFID-funded research project with the World Bank to evaluate various mechanisms for disaster risk financing. The research was aimed at sovereign stakeholders in developing countries, such as the Government of Ethiopia, as well as international development organisations, including DFID. The focus was on providing these stakeholders with a methodology to evaluate disaster-risk financing instruments, along with practical examples. An analytical framework was used to compare the costs of financing a spectrum of potential disasters through various instruments, including contingency funds, contingent credit facilities, budget reallocation, humanitarian aid and insurance placement. The framework was applied to the economic and disaster climate in five anonymised countries as well as, in greater detail, to Ethiopia. Rural safety nets in low-income countries remain a challenge to develop, yet the Government of Ethiopia has developed and implemented the Productive Safety Net Programme (PSNP), providing nearly 8 million Ethiopians with the means to work their way out of chronic poverty. The paper (A Methodology to Assess Indicative Costs of Risk Financing Strategies for Scaling Up Ethiopia’s PSNP) comparatively analyses potential risk finance structures that support drought response through the PSNP, under the same 5-step methodology outlined in the Guidance and Case Studies paper. The contingent liability is defined as a hypothetical version of the PSNP in which districts receive automatic financing based on an early warning system that is tied to a water deficit index. Under these hypothetical ‘rules’, the PSNP scale-up supports annually, on average, 2.9 million transitory poor, requiring an average expenditure of US$139 million per year. Three primary hypothetical risk strategies are then considered to finance these expenditures. The initial instrument in all strategies is the federal contingency budget, which must be exhausted before other instruments can be applied. Unlimited humanitarian response is always assumed to be a last resort. The base case, Strategy A, includes only these instruments; strategies B and C consider a layer of insurance and budget reallocation, respectively, between the two (see figure below). Strategies A and C rely on humanitarian response when the federal contingency budget and budget reallocation are depleted. 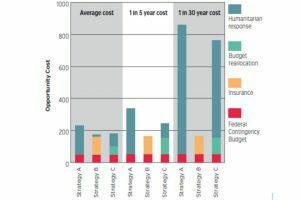 Strategy B is the cheapest on average as insurance effectively costs less than humanitarian response. The cost savings of insurance also rise for more severe droughts; the results of the costs of a 1-in-5-year and a 1-in-30-year event demonstrate this clearly. provide funding in a timely manner post-disaster, since clear payment terms are arranged pre-disaster. there may be limited capacity in the insurance markets to place cover in the markets at the levels countries would like, so more traditional financing mechanisms (such as appealing for humanitarian aid) are still likely to be required. The purpose of insurance is to transfer risk away from those who cannot bear it to those who can. Insurance pools risk to diversify losses across people and across time, and allows swift insurance payouts to be made following a disaster, giving economies a better chance to recover and become resilient. There is worldwide acceptance and recognition among the developed nations that insurance provides a viable and effective way forward. The G7 Initiative on Climate Risk Insurance aims to increase access to insurance coverage for up to 400 million of the most vulnerable people in developing countries by 2020. Insurance helps developing countries become more resilient and ultimately less reliant on overseas aid. Currently, a very limited number of natural disaster losses in low-income countries are insured, leaving a substantial opportunity. The private insurance sector is keen to engage, but no one insurer or company would take on the entire initiative to research and create a market for others to benefit from, so this oversight and development is being provided by the UK Government. With this push, the private sector markets have demonstrated a willingness to support these risk-financing initiatives. In November 2015, eight Lloyd’s syndicates committed capacity of US$400 million to underwrite such schemes(1). More than just Corporate Social Responsibility, this is an opportunity for businesses to enter an under- served risk market that is poised to grow. subsidies through technical assistance and premium funding to cover the ongoing costs of providing insurance cover. DFID has a growing disaster-risk finance and insurance portfolio, which includes a substantial committed contribution of risk capital to the African Risk Capacity (ARC). This risk capital is provided in the form of a returnable loan, with the aim for ARC to be self-sustaining after the period of the long-term loan. This is an innovative approach in humanitarian aid. The provision of risk capital allows a sustainable insurance risk-pooling arrangement to function but, as a long-term loan, demonstrates better value for money for taxpayers than typically provided humanitarian aid. ARC is a risk-pooling arrangement that provides payouts to participating developing African countries in years that they experience a moderate or severe drought. In 2015, ARC made payouts of US$25m to drought-stricken Mauritania, Niger and Senegal more swiftly than humanitarian aid could reach these countries (2). The pooling arrangement is growing in terms of countries covered and aims to reach 150 million people by 2020, as well as considering other weather events such as flood. ARC effectively works as an insurer, holding its own funds and risk capital to pay out for ongoing drought losses. However, owing to its size and lack of diversification, ARC does not carry the most extreme risks: the extreme drought risk coverage is placed in the global private insurance markets. GAD supported the evaluation of the initial business case for DFID’s investment in ARC, and provides ongoing analytical and actuarial support in reviewing ARC’s ongoing operations. This independent review helps to ensure that DFID’s investment in ARC, and the vehicle as a development tool in general, is appropriately managed and continues to deliver value for money in building resilience and keeping people out of poverty. Pacific Catastrophe Risk Assessment and Financing Initiative, providing 15 Pacific island countries with disaster risk assessment tools to understand and manage their exposure to climate events such as hurricanes and earthquakes. Insurance is a long-term solution to support developing countries in tackling poverty. There is a role for risk pooling and appropriate risk transfer – including insurance – in a developed economy as well. The UK Government makes widespread use of risk-pooling and insurance arrangements to make the UK economy more resilient, such as helping to provide affordable home insurance in flood-prone areas through the creation of Flood Re (3). With the international community rallying behind the effectiveness of insurance in development, and with its existing national experience, the UK Government is confident in engaging with the UK insurance industry. There is a strong desire from both the UK public and private sectors to play a full role in meeting the risk finance needs of vulnerable developing countries. There is still a lot of work to be done and ample opportunity for the UK Government and other developmental organisations to get involved and support insurance as a tool for international development further. Existing arrangements, like ARC and others listed above, can be scaled up to include more people, more perils or wider scopes of coverage. New arrangements are being considered regularly. DFID is at the forefront of considering all of these opportunities for investment, and GAD is there to support a robust analytical evaluation of the effectiveness and potential impact of these programmes. I would like to thank colleagues at DFID for their assistance in compiling this article. Clarke, D. J., S. Coll-Black, N. Cooney and A. Edwards. 2016. A Methodology to Assess Indicative Costs of Risk Financing Strategies for Scaling Up Ethiopia’s Productive Safety Net Programme. The World Bank Group, Washington, D.C.
Clarke, D. J., N. Cooney, A. Edwards and A. Jinks. 2016. Evaluating Sovereign Disaster Risk Finance Strategies: Guidance and Case Studies. The World Bank Group, Washington, D.C.